Suppose we collect two sets of data: 1) Obama’s record, what he had already achieved by election eve 2016 and 2) Trump’s words, his campaign pledges up to election eve 2016. We are comparing words vs. deeds—Obama’s deeds, Trump’s words, for the purpose of trying to make sense of the liberal’s extreme and diverse responses to these two different political figures. My hypothesis is that the responses are the opposite of what one would expect based on the actual records. Trump should have been embraced by the liberals. Obama should have been docketed for impeachment. To get a better sense of just how true this is let’s see how the Archangel—on a score of one to ten—scores in each of these three critical categories: healthcare, ecology and civil liberties. In 2014, half way into Obama’s second term, a study was completed comparing health care among eleven industrialized nations. While spending dramatically more on health care than her sister nations, the United States was ranked lowest. (Bort, 7/14/17). Obama’s response was “The Affordable [sic] Care Act,” also known as AbysmalCare. It is bizarre to have witnessed the liberals ply Obama with bonbons for allowing the health insurance industry to write themselves a fat check while mining the pockets of the rest of us. For many, there are thousands of dollars in deductibles and thousands of dollars in premiums. In essence, many of the middle class are self-insured. They draw down what they put in and call that an insurance benefit. And if you don’t join up and play ball, you are threatened with heavy fines. This is what is known as extortion. AbysmalCare was a great con. It was supposed to cost $983 billion over ten years. After seven years it had already cost $1.938 trillion. It was supposed to provide 23 million with insurance through its exchanges. Only 9 million were so fortunate. You were supposed to be able to keep your plan if you liked it. Millions who liked their plans lost them and lost their doctors as well. What kind of grade should Obama get for healthcare, zero, one, two? Not much more. He made things worse, not better. Though you wouldn’t know from all the cheering he garnered from his liberal supporters. Well what about the environment and global warming? Surely the Archangel won’t let us down in these critical areas. I am afraid we are in for another disappointment. On March 31, 2012, The Guardian reported that a study of 32 dolphins found that “many of the 32 dolphins . . . were underweight, anemic and suffering from lung and liver disease, while nearly half had low levels of a hormone that helps the mammals deal with stress as well as regulating their metabolism and immune systems.” In May of the same year The Audubon Society reported that the effects of the disaster had reached as far north as Minnesota. Petroleum and Corexit—the chemical used to disperse the spill—were found in pelican eggs on Marsh Lake. All of this was preventable if Obama had acted responsibly. It was well known from the George W. Bush years that the Minerals Management Service (MMS)—the agency in the Department of the Interior responsible for safeguarding the environment from the risks of oil drilling—was probably one of the most corrupt agencies in the United States government. Obama’s solution to the problem was to nominate his “great” and “dear” friend Ken Salazar to reform the Department of Interior and to get it to serve the people rather than commercial interests. But instead of putting limitations on new offshore drilling, Salazar—with Obama’s enthusiastic support—immediately put 53 million offshore acres up for lease in the Gulf in his first year alone—an all-time high. No one in MMS gave much thought to the possibility that there would be a blow out on one of the Gulf oilrigs. No one in government or industry gave much thought to what could be done in the event that one occurred. No assessment was made of the possible harm to wildlife if there were a blowout since the Bush administration required no such studies when issuing its permits and the Obama administration rubber stamped what the Bush people had put in place. BP—a company with the worst record for safety, responsible for the Alaska pipeline rupture in March of 2006—issued its own study claiming there was nothing to worry about. Since 2007, BP has received 760 citations for “egregious and willful” safety violations—those “committed with plain indifference to or intentional disregard for employee safety and health.” The rest of the oil industry combined had received a total of one. Eighteen days after Obama announced his plan for a dramatic increase in drilling,—reassuring his listeners “that oil rigs today generally don’t cause spills. They are technologically very advanced”—the Deep Water Horizon Rig exploded in a fireball that killed eleven workers. The “moratorium” on drilling announced by the president did little to prevent future disasters. The ban halted exploratory drilling at only 33 deep water operations, shutting down less than one percent of the total wells in the Gulf. Said Interior Secretary Ken Salazar, “the moratorium is not a moratorium that will affect production,” which continues at 5,106 wells in the Gulf, including 591 in deep water. 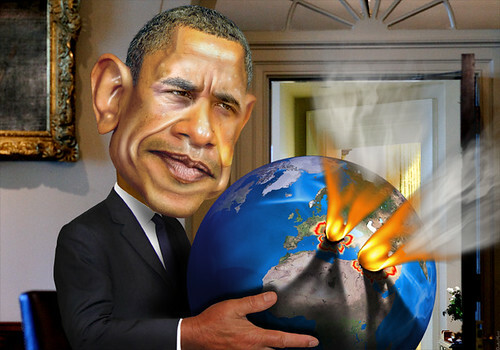 The United States is the world’s biggest carbon producing culprit and its assault on the environment escalated during the Obama administration. Fracking and natural gas production soared despite all of the lip service he paid to environmental protection during his term in office. He cancelled the Keystone XL pipeline in 2015 to look good on the eve of the international meeting and because it’s construction was no longer needed. Domestic fossil fuel production increased so much that transportation of tar sands oil from Canada was no longer necessary. In addition, the United States approved other pipelines that were less visible and train transportation handled the rest. Production increased so much that oil prices plummeted and have still not recovered. If one combines the effects of the Gulf oil spill, the vast expansion in oil leases that occurred during the Obama years with the harmful effects of fracking one ends up with dereliction without parallel. In the case of the Gulf oil spill, Obama is guilty of gross and willful negligence. In the case of expanded oil drilling and the use of fracking, he is guilty of heinous disregard for the eco-system and human well-being. If depredation of the environment were a criminal offense, Barack Obama would be doing time. Well, let us pass on to what is probably the key concern of any true liberal: civil liberties. By that I mean the first ten amendments of the Constitution, also known as the bill of rights: freedom of speech, freedom of assembly, freedom from search and seizure, and especially the right of habeas corpus. A person cannot be arbitrarily arrested and detained. He must be charged with a crime. He is guaranteed a speedy and fair trial. The very First Amendment to the Constitution guarantees us our Freedom of Speech. “Congress shall make no law . . . abridging the freedom of speech.” In support of that freedom, Congress passed “The Whistleblower Protection Act of 1989.” It is a violation of that act for a government authority to take or threaten to take retaliatory action against an employee who reports government misconduct. Chelesea Manning was sentenced to thirty-five years in prison after releasing military documents and military footage of a helicopter gunship shooting into a group of Iraqi men, two of whom were war correspondents working for Reuters. Seven men were killed, including the reporters and two men trying to rescue the wounded. Manning was working as an intelligence analyst for the Army and had access to these files. She was concerned about the apparent disregard for civilian life and so released the footage. It has been argued that these killings were war crimes. It would seem that Chelsea Manning qualifies as a “Whistleblower” and that President Obama violated the “Whistleblower Protection Act” by having Manning imprisoned. He also is in violation of the First Amendment right to free speech. The president swore to uphold the United States Constitution. Violation of the oath of office is an impeachable offense. On June 23, 2013, Edward Snowden landed at Moscow’s Sheremetyevo airport. Snowden had been a computer specialist working for the CIA. He leaked thousands of documents revealing to Americans and the world the extent of the NSA surveillance program, at home and abroad. Snowden was seeking asylum after the U.S. Department of Justice charged him with two counts of violating the Espionage Act of 1917 and theft of government property. Once again this is a case of a whistleblower being denied his rights under the First Amendment and the Whistleblower Protection Act. Once again Barack Obama had failed to uphold his oath of office. On his watch, there were eight whistleblower prosecutions under the 1917 Espionage Act—more than double those under all previous presidents combined. At the time of her arrest on July 15, 2010, Lynne Stewart was a seventy-year-old grandmother suffering from breast cancer. She was sentenced to ten years in prison for allegedly supplying material support to Sheikh Omar Abdel-Rahman, Egyptian cleric convicted of planning terror attacks, whom she was representing in court. Lynne had devoted her life to defending unpopular cases, cases that went begging for representation. She was imprisoned on a technicality. She was denied medically necessary treatment. It took a grass roots movement extending to countries around the world to grant this menace to society her liberty. For Lynne it was the system of justice that was on trial, not just the defendant, which means she often found herself at odds with the government. Lynne was courageous. She was defiant. And she was an excellent litigator, which is why Obama’s Justice Department wanted her out of the way. With the exception of Ramsey Clark, the liberal establishment remained silent. Of all the civil liberties, the right of habeas corpus is the most vital. Freedom of speech, freedom of assembly, etc., are meaningless if I am not free to move about in society under my own recognizance. If I can be locked up at any time and detained indefinitely without charge and without recourse to regain my liberty then I am a non-person. I have no personal rights. I don’t exist. And yet this is what Barack Obama has left us as his most important legacy. While the liberals were out marching for the disease du jour, lobbying for the disabled and rescuing dogs in distress, Barack Obama was busy instituting a police state. According to Subtitle D, Counterterrorism, Section 1021 of the Defense Authorization Act of 2012, the president has the authority “to detain covered persons . . . pending disposition under the law of war.” A covered person is 1) someone “who planned, authorized, committed, or aided the terrorist attacks that occurred on September 11, 2001, or harbored those responsible for those attacks,” or 2) a person who “who was a part of or substantially supported al-Qaeda, the Taliban, or associated forces that are engaged in hostilities against the United States or its coalition partners, including any person who has committed a belligerent act or has directly supported such hostilities in aid of such enemy forces” (italics added). It is relatively easy to make a case that someone “substantially supported al-Quaeda or the Taliban.” It is even easier to make the case that someone supported “associated forces,” whatever they may be. Easiest of all is to prove that someone “has committed a belligerent act,” i.e., engaged in an antiwar protest at the gates to the White House. Persons so identified can be detained “under the law of war without trial until the end of the hostilities authorized by the Authorization for Use of Military Force,” which is to say indefinitely. Clearly N.D.A.A. 2012 is a violation of the U.S. Constitution,  the Constitution that Barack Obama swore to uphold. Next to his idol—Abraham Lincoln —he was probably the most impeachable president this country has ever seen. His grade in Civil Liberties is zero. Obama: War and peace, mostly war. But the story doesn’t end here. There is the issue of endless war, an issue of little abiding interest for the liberal. His only wish is that he not be disturbed by the sights and sounds. Yet Obama sustained wars in Iraq, Afghanistan, Syria, Libya, Yemen, Somalia and Pakistan. Entire societies have been decimated. Hundreds of thousands of civilians have been killed off by disease, bombs and gunfire. All without any interference from a quiescent electorate. General Dynamics is one of the largest military contractors in the country and has been one of the primary beneficiaries of Obama’s wars of aggression. It was Henry Crown of Chicago who turned the company into what it is today. His son Lester met Obama in 1989 when Obama was twenty-seven years old. The Crown family have been loyal supporters ever since and they have gotten their money’s worth. As his administration approached its end, Obama managed to extend his bloody legacy. In March of 2015, Saudi Arabia’s Minister of Defense Prince Mohammad bin Salman decided it was time to start dropping bombs over Yemen, a poor, developing, defenseless country. Obama, never one to let down a friend in need, agreed to supply the aerial refueling without which the bombing could not have taken place. Once again, Obama comes in at zero, this time on the Peace Scale. Yet his fans cannot get enough of him. Penguin Random House has agreed to pay $84.7 million for two books, one by Barack and the other by Michelle Obama. Apparently the hunger for anything about He of the silver tongue goes undiminished. And to top it all off, on July 26, 2017 the Nation Magazine—once a voice for intelligent, progressive political thought—sent me a request, via e-mail, to sign a birthday card for Barack Obama. No comment. So much for the Archangel. What about the Antichrist? One doesn’t ask “who is Donald Trump?” He is overflowing with personality and program. One can’t pin one’s illusions on him, or claim ignorance of what he stands for, which is why he is so reviled by the liberals. Donald Trump is darkness visible. The liberal prefers his darkness hidden behind a facade of righteousness. Tears were shed when the Donald was elected. These were tears for bitter despair. Trump is, of course, a loudmouth braggart with a limited vocabulary. He has no polish and little or no finesse. “Trump’s style is to say what many others think but know better than to verbalize. He is an outspoken reflection of what we are . . . racist, misogynist, and with a chip on our shoulders because we’re “exceptional” (Alpert, January 16, 2018). The Donald is emotionally and intellectually handicapped but no more so than some of his predecessors. He is down to earth and in many ways honest about who he is and what his intentions are. There is no mask, no camouflage, no pretense. He represents an assault on American exceptionalism. He is political reality stripped bare, the emperor without his clothes. He is the other side of the moon, the side we can’t see and don’t want to see. He is self-serving ambition stripped bare. In other words, he is the average American politician without the hypocrisy. But of course we have not been silent about Donald Trump. Largely because he has shattered the myth that there is anything savory about the American politician or the two party system. The disrespect he has been shown is a healthy antidote to the mindless genuflection his predecessor inspired. He has shown us that there is nothing holy about our government or the men and women in high places who speak for us. For this we owe him gratitude. So what does this monster have to say for himself? Here is a sampling from his campaign for the presidency. (See Johnson, January 22, 2016) For the most part I will choose those items that I assume would have the most appeal to those who call themselves liberals. “Get rid of Obamacare” I believe, based on my comments above, was a good idea, though I don’t think Trump had ever thought out a viable alternative. “Rebuild the country’s aging infrastructure.” I don’t see how anyone can argue against such a proposal, nor am I aware that any prior presidential candidate ever came up with such a possibility, obvious as it is. “Save Medicare, Medicaid, and Social Security without cutting benefits,” certainly near the top of any liberal’s wish list. “Make medical marijuana widely available to patients, and allow states to decide if they want to fully legalize pot or not” puts Trump in the avant garde of progressive thinking on this subject. Here is one of my favorites: “Stop spending money on space exploration until the United States can fix its potholes.” Makes sense to me. Here is Donald being unusually open about the United States policy of killing off journalists: Oppose the killing of journalists: ”I hate some of these people, but I would never kill them.” Makes him seem civilized. “Invest more heavily in programs that help military veterans transition back to civilian life.” Once again, this is a humane proposal. Recent presidents have treating soldiers like cannon fodder to be tossed once used. “Bring back jobs from China—and Mexico, Japan and elsewhere.” Sounds like a good idea to me. The American economy is in sorry shape. There is a blight of abandoned factories and a superabundance of desperate men and women who were once productive members of society. Tell Ford Motor Co.’s president that unless he cancels plans to build a massive plant in Mexico, the company will face a 35 percent tax on cars imported back into the United States. Here is a proposal with some teeth in it and once again should be a benefit to the American economy. Here’s another one, same idea: Force Nabisco to once again make Oreos in the United States. And bully Apple into making its ”damn computers” and other products here. Once again I think these are good ideas if the idea is to rebuild the American economy. No longer charge income tax to single individuals earning less than $25,000 per year or couples earning less than $50,000. Sounds sane to me. And here is Trump on illegal immigrants, “Deport the almost 11 million immigrants illegally living in the United States.” Deporting immigrants has no appeal to me. 11 million sounds like an astounding number. Yet bear in mind that Barack Obama had already deported 2.5 million immigrants. Do away with NAFTA (North Atlantic Free Trade Agreement) and TTP (Trans-Pacific Partnership), which, to me, makes a lot of sense. In essence, these agreements allow the participating countries to supersede the restrictions of national governments so as to increase the profits of the corporations that crafted them. The agreements disallow tariffs and permit the corporations to sue the governments that try to get in their way. National sovereignty has been exchanged for corporate sovereignty. As corrupt and incompetent as our representatives are, every so often they pay attention and throw us a few crumbs, if only for the purpose of getting re-elected. The CEOs of our multinational corporations have but one loyalty: the bottom line. NAFTA permits U.S. corporations to get cheap labor in Mexico, to ignore ecological requirements that would be enforced by their own governments if NAFTA were not in place. One obvious consequence is the outflow of jobs from Canada and the U.S. to Mexico, where labor costs are considerably lower. Close to 683,000 American jobs were lost to Mexico. “Methanex Corporation, a Canadian corporation, filed a US$970 million suit against the United States because, it said, a California ban on gasoline additive MTBE was hurtful to the corporation’s sales of methanol.” (NAFTA) It turns out that MTBE had found its way into wells in the state, a condition that was hurtful to many Californians. This is what it means to surrender one’s national sovereignty and to allow corporate CEOs to take charge of our collective destiny. It’s the Wild West all over again. I think we owe the Donald a big hug for opposing these pernicious agreements. Maybe he’ll bring an end to globalization, in which corporations dominate nation states. That would be a good thing. The Donald was the only candidate in recent memory to be antiwar: He was against war with Russia. George. W. Bush wanted war with Iraq. Obama wanted war with Afghanistan. Ms. Hillary wanted to nuke the Russkies. Only the Donald wanted to keep the peace, our first and only peace candidate. Well, we have Trump and Obama side by side for the liberal to assess. My hypothesis is that the liberal should choose Trump and impeach Obama. Now the challenge is to try and make sense of the liberal’s decision to embrace Obama and impeach the Donald. We are in a bizarre position. The Archangel who is supposed to represent everything that is noble and worthwhile turns out to be a primary source of evil while the Antichrist—based on his campaign for the presidency—turns out to be relatively benign, a new dealer, in the spirit of FDR. Reality is stood on its head. The response to these two is the opposite of what one would expect based on what they have done and said. We have entered the realm of the irrational. One could say that the liberal lives in a glass bubble and doesn’t like to be disturbed. And so he denies anything that doesn’t fit into his exceptionalist view of political reality: Politicians are well-intentioned, decent folk who will govern with integrity and dedication to the common good. This belief persists despite all evidence to the contrary. And then along comes the Donald who is too blatantly real to be denied. Like a sledgehammer he shatters the liberal’s phony reality, revealing the politician for what he has always been: an ill bred, self-serving egomaniac. The liberal has a fit. If one were to think of the liberal as a political four-year-old, one probably wouldn’t miss the mark by much. A four-year-old believes what he is told by the adults in his life. And if it turns out that the adults err on the side of unkindness, the four-year-old will create an idealized parent in his imagination, one that provides all that the real parent is lacking. The unloving parent—via denial—is transformed into the loving, wished for parent. The child’s belief in that idealized parent is unshakeable. For eight years the four-year-old liberal was in a trance state, lulled into somnolence by the cadences of a rhetoric seething with insincerity. Yet his inflections and incantations had a magical effect. Like Pan, he had but to pick up his pipes and his enchanted followers would leave known reality for a happy and carefree existence romping in the forests, scattering daisies along the way. Our Archangel was a blank screen with no personality, no program. He could stand for anything and nothing. And change his mind the next day without the blink of an eye or a change in his status amongst a mindless electorate. On assuming office, Obama was greeted with tears of joy. The first “black” has become president. More tears as he leaves office along with a steady stream of votives and encomiums. I put black in quotes. Obama’s father was a middle class economist working for the Kenyan government, not a descendant of a slave or a member of an oppressed class. What about the Donald? Here we see something quite different. Instead of a muted response based in denial, we see an hysterical response based in transference. Here is an anecdote to illustrate my point. I am downtown, in Manhattan, on Third Avenue, seated at a lunch counter. I have ordered toasted English muffin with marmalade and hot tea with lemon. To my left is a heavy-set gentleman with long white hair tied back in a ponytail. He has ordered a tuna fish salad sandwich and black coffee. I will call him Bob. To Bob’s left is another gentleman whom I can’t make out. I can see his hand dipping a French fry into some ketchup. That last sentence got my attention: “nothing but a self-centered, loud-mouthed, belligerent bully who doesn’t know when to shut up.” Then I did something I never should have done. It was intrusive and inappropriate. It was bad manners. Just a tad reckless. I was risking a punch in the nose. Bob looks my way without a hint of kindness in his eyes, taking my measure for a long moment. Then he turns back to his plate, puts down his sandwich, stares off into space, seeming to be looking for an answer to my question. He mumbles something to himself and then with a broad smile on his face looks my way and says, “My mother.” Bob is almost laughing. A tremendous weight has been lifted off his shoulders. His demeanor has changed dramatically. He resumes his conversation with his friend on a different topic in a different mood. This is an example of what is known as transference. An emotional dynamic from childhood is transferred into adult life. It happens in marriage, in the workplace and apparently in political life. Bob is not upset about Trump. He is upset with his mother, in a rage about how she treated him as a child. Rage for a hated parent is transferred on to a political candidate who resembles the mother. Multiply this by the millions and what we have is mass hysteria, which is what I think we have. There is not a note of sanity in the reaction to Trump during his campaign. It is pure neurosis. And by contagion others are dragged along who might not have so responded. The hysteria does not subside. Trump has been in office for a year and the simmering hatred continues. The Nation Magazine along with organizations like “Moveon.org” would probably be called “liberal.” It is these liberals who provided the platform for Obama’s dismal performance. It is the liberals who are playing a leadership role in defining the current political dialogue, which is devoted almost exclusively to lambasting the Donald, accusing him of one crime or another and beating the drum for his impeachment. The liberals have millions of unthinking followers. Based on their judgment of Barack Obama, it is reasonable to wonder if this class should be entrusted with leadership of a large segment of the American political body? What do they stand for and where do they want to lead us? Are they truly a progressive element in our society? If one takes a step back what one discovers is that for the most part liberals are a quiescent lot with no sense of a future that is any different from the present. For the liberal, politics is diversion, entertainment, an opportunity to perform, to display his noble outlook on life, to show that he “cares.” There is a sanctimonious and sentimental involvement with issues of race. Government itself is never challenged. Liberalism is neither an ideology nor a form of government. It is a pose. Liberals are crusaders, always on the lookout for a cause to champion: animal rights, LGBT rights, immigrant rights, the rights of Afro-Americans. Liberals jump from one cause to the next. They can’t get enough. As Luciana Bohne puts it, their brains are “pickled in the formaldehyde of identity politics” (Smith). These causes are an opportunity to put their do-goodism on display and then to retreat to a life of personal contentment. “Love me I’m a liberal,” says Phil Ochs in a song of the same title. The liberal does not know political reality and doesn’t want to, which is why he has so little political intelligence. He is anxious and insecure. He is easily frightened, thin of foreign policy, strong on personal comfort, quick to abandon reason in favor of emotional reaction. All of this makes the liberal a political menace if the goal is a rational political response in times of stress and confusion. The liberal will be controlled by the puppet master, the one who runs the deep state, the one with the soothing rhetoric, the one who tells the biggest lie. And this master has but one goal: endless war. It is endless war that will be our undoing if we let it. And that is where the liberal is taking us by his mindless submission to the wolf in sheep’s clothing. Personally I think the military parade is a brilliant idea. This is the reality. We are a warrior State. That is how the world should see us. That is how we should see ourselves. We spend trillions of dollars a year preparing for war. We have been at war for the past eighteen years. Our missiles are threatening Russia, China, Korea and Iran with annihilation. Bring on the tanks and airplanes and the troops marching down Pennsylvania Avenue in lockstep. Nothing like a good parade. And while we’re at it, why not change the Department of Defense to the War Department? In fact that is what it is and has been all along, maybe that’s what we should call it, thereby introducing a measure of sanity into the Orwellian madness. As the above demonstrates, Trump is in the process of dismantling the government—that part that would serve the common good—and passing along what he has saved to the State whose primary functions are war abroad and oppression at home. Thus he is shedding the sheep’s clothing—the benign, caring government—and revealing the wolf beneath. Once again, some reality therapy. In the process of weakening the central government Trump is empowering the local governments that will become more and more involved in critical issues like environment and healthcare. The state of California—in defiance of the central government—has established itself as a sanctuary for immigrants who are at risk of being deported. This is an example of taking central power and bringing it to the local government where it can do more good. When Barack Obama was deporting 2.5 million immigrants there was no such sanctuary to protect them. As strong central government—the State—becomes less and less relevant, less and less powerful, eventually it withers and dies. This is good for the world of living things, including the species known as homo sapiens. The State will not be missed. It is not a form of government. It is an ideology that is superimposed upon a government, an ideology that has war making as its core. The State will address the needs of the populace at that minimal level necessary to get the populace to cooperate in the making of war. The State needs to get the country to do its bidding, which is to say it needs to get the population to accept and support the sacrifice that war entails. There are economic and social sacrifices. One will even be asked to sacrifice one’s life. Here is where propaganda comes in. There is a constant outpouring of lies masquerading as “news,” as Trump aptly observes, i.e., “fake news.” Propaganda establishes an alternate reality that we are expected to subscribe to, unquestioningly, unthinkingly. People who challenge the lie—as Chelsea Manning, Edward Snowden and Julian Assange demonstrate—pay a heavy price. As the Antichrist, Trump brings into question everything we hold to be sacred. He compels us to see the reality that we want to hide from. He represents a “refreshing gale of hopeful revolutionary oxygen.” (Snefjelia) His denial of global warming has resulted in activating a somnolent citizenry. People who never before participated are now participating in the life of the polis. The Donald has revealed to us the moral bankruptcy of the liberal class who by embracing Barack Obama have betrayed everything that true progressives stand for: peace and human welfare the world over. Trump has pointed the way to peace and cooperation with Russia. He has challenged the media to be honest and to quit manufacturing fake news. He has brought the two party system into question. I doubt political life in this country will ever be the same. Dave Alpert, “The ugly American: It’s not really about Trump,” Intrepid Report, January 16, 2018. Jeffrey H. Anderson, “The Five Worst Things about Obamacare,” The Weekly Standard, February 23, 2017. Ryan Bort, “How Bad Is US Health Care? Newsweek.com, July 14, 2017. Randolph S. Bourne, War and the Intellectuals, Hackett Publishing Company, 1999. Nicholas J.S. Davies, “The Democratic Party’s deadly dead-end,” Intrepid Report, July 6, 2017. Tim Dickinson, “The Spill, the Scandal and the President,” Rolling Stone, June 8, 2010. Jenna Johnson, “Here are 76 of Donald Trump‘s many campaign promises,” Washington Post, January 22, 2016. Stephen Lendman, “Worst on record cholera epidemic in Yemen,” Intrepid Report, July 25, 2017. Robert Rapier, “The Irony of President Obama’s Legacy,” Forbes, January 15, 2016. Charles Hugh Smith, “Virtue-Signaling the Decline of the Empire,” Of Two Minds, February 28, 2017. Robert Snefjelia, “Musings on the Trump Phenomenon: The Art of asymmetric Forthrightness, Countercurrents.org., March 13, 2018. Brian Trautman, “Why the NDAA is Unconstitutional,” Counterpunch, January 18, 2012. Dustin Walker, “Obama’s Orwelllian Legacy,” Realpolitics.com, June 11, 2013. “Environmental Impact of the Deep Water Horizon Oil Spill,” Wikipedia. Go to https://keeptapwatersafe.org/global-bans-on-fracking/ for a list of states and countries where fracking has been banned. See 10th Amendment center for a full discussion of D.A.A. 2012. [4 ]For an entertaining analysis of why the wall would be impossible to build see, “Fred Reed On Everything,” January 3, 2018. See Dustin Walker, “Obama’s Orwelllian Legacy,” Realpolitics.com, June 11, 2013. Of course, Trump’s position on global warming makes him an enemy of the human race. Nonetheless, during the campaign, he had done nothing to harm the environment, while Obama had already overseen the worst—preventable—ecological disaster in U.S. history, had promoted fracking, helped generate earthquakes by the hundreds, expanded oil drilling and failed to sign the Kyoto protocol. This entry was posted in All Posts News Politics and-or Videos, Civil Rights, Environment, Health Care, Immigration, Imperialism, Trade and tagged Arthur D. Robbins, Barack Obama, Chelsea Manning, Donald Trump, Free Speech, Liberalism, Lynne Stewart, Same As It Ever Was. Bookmark the permalink.